After the bookstore, I go to Rustica bakery for an excellent coffee drink (macchiato nowadays) and their bittersweet chocolate cookies. Post-bookstore Rustica is one of my very happiest places. This entry was posted on Thursday, March 3rd, 2011 at 3:00 pm	and is filed under Books, Feeling Minnesota, Food and Drink, Shopping. You can follow any responses to this entry through the RSS 2.0 feed. Both comments and pings are currently closed. When I was a teenager, my dad would always take me to Dairy Queen for chili cheese fries after my orthodontist appointments. Yes, he is an awesome dad! I read Bee Season a few years ago, back before I was blogging. I thought it was really interesting, though I’ve heard none of Goldberg’s other stuff is in the same league, which is too bad. It’s a really compelling look at religion, true, but the family dynamic in it is especially fascinating, I think. Read Lady Oracle in 11th Grade English class and hated it. It kind of started me on my whole “I do not like Margaret Atwood” line, which I less vociferously defend today (since Cat’s Eye and The Handmaid’s Tale are really very good). those cookies sound excellent — I think I’m going to have to dig up a recipe. As for Half-Price Books, I (once again) am jealous! 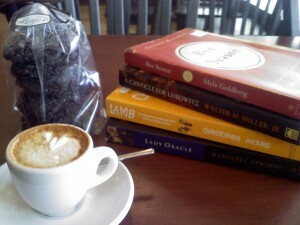 Oh yay for Canticle for Leibowitz and bittersweet chocolate cookies! Actually, everything sounds wonderful. Steph, my mom used to take us to Friendly’s for ice cream after our appts, and I think the ritual has stuck with me. I was impressed by Bee Season, and want to revisit it. And never read Lady Oracle, but will probably be using Handmaid’s Tale for the book group, since our first book was Gilead (second is the Road) and HT is set in the Republic of Gilead, seems a tidy fit. I missed Lady Oracle, too, and when I was researching, turned up it and Surfacing as good candidates, and this was a lovely, like-new copy.